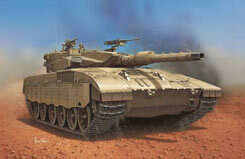 All Products > "03134 Revell 1/72 Merkava Mk Iii"
In the spring of 1989 the first Merkava Mk. III was handed over to the Commander of the 188th brigade of the IDF (Israel Defence Force) in an official ceremony on the Golan Heights. This tank is the product of the continuous development of the two previous types. As armament it carries a 120 mm cannon, there are 3 MGs mounted on the turret and inside the turret is a permanently installed 60 mm mortar.